North Attleboro – Samuel “Mac” McLanahan III, 74, died peacefully on Thursday, December 4, 2014 surrounded by his loving family and friends. He was the beloved husband of Rae Ann (Federici) McLanahan of North Attleboro and Mansfield, MA. He was the son of Dr. Samuel McLanahan, Jr. and Evelyn Sharp McLanahan of Baltimore, MD. His maternal grandfather, Reverend Henry Talbot Sharp, fought in the Civil War. He leaves his children Allison (Chris) McLanahan Mamere of Benicia, CA, Emily (Murphy) McLanahan of San Francisco, CA, Mark (Jacqueline) McLanahan of San Anselmo, CA, Chad (Laura) Markell of Sydney, Australia, Sarah (Erik) McLanahan of Gloucester, MA, and (bonus daughter) April Verch of Pembroke, Canada; his grandchildren Ella, Dixon, and Jasmine McLanahan, Charlie Markell, and Beatrice Hinderlie McLanahan; and sister Mary McLanahan of Baltimore, MD. He was the close friend and former husband of Alice Markell Mayn of Petaluma, CA and Stephanie (John) Weisz of North Attleboro, MA. Mac was born in Baltimore on November 10, 1940 and lived there for many years, graduating from the Gilman School in 1959. He attended Wesleyan University in Connecticut and later returned to Baltimore where he worked in production for the popular children’s television program Romper Room, followed by several years as an account executive for Emery Advertising. He moved to North Attleboro, MA in 1979 to join Lyons Advertising, where he became Vice-President. More recently, Mac was the guiding force behind Newslynx, a marketing consultancy. As a devoted member of the North Attleboro community, he has served on the Board of Trustees of the Richards Memorial Library and was active in the local Chamber of Commerce and Historical Commission. 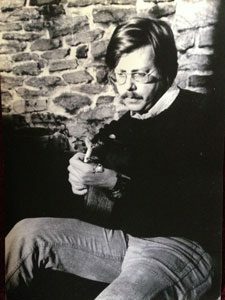 Mac had many musical talents, among them songwriting, singing, and playing guitar and dobro, and he was a gifted photographer. Mac is perhaps best known for his role as Artistic Director and co-founder of the Mansfield-based Rose Garden Coffeehouse. For 25 years the Rose Garden and its volunteer staff have played host to some of the most renowned folk and acoustic musicians in North America. The Rose Garden has become a regional beacon for music lovers, and a warm, inviting home for the community during its annual September through May schedule. Through his passion for singer-songwriters and their music, Mac became a cherished friend, and in some cases a second father, to many of the talented and wonderful Rose Garden fans, volunteers, and musicians. Family and friends are invited to attend his memorial service at 5:30pm on Wednesday, December 10, 2014 at The Congregational Church, 17 West Street, Mansfield, MA 02048. Following the service, there will be a celebratory reception in the downstairs vestry, longtime home to the Rose Garden Coffeehouse. Please join to remember Mac and celebrate his life as he lived it – with good music, good food, kind words, and the ones he loved. In lieu of flowers, gifts may be made to Dana-Farber Cancer Institute in memory of Samuel “Mac” McLanahan III to support cancer research and patient care at Dana-Farber Cancer Institute, via http://www.myjimmyfundpage.org/give/mclanahan.